Amidst horrendous flooding around Manila and major rice-growing across Luzon in the Philippines, some good news has emerged for rice farmers – Submarino rice – rice that can survive around 2 weeks of being under water. Rice is unique because it can grow well in wet conditions where other crops cannot, but if it is covered with water completely it can die, leaving flooded farmers bereft of income. 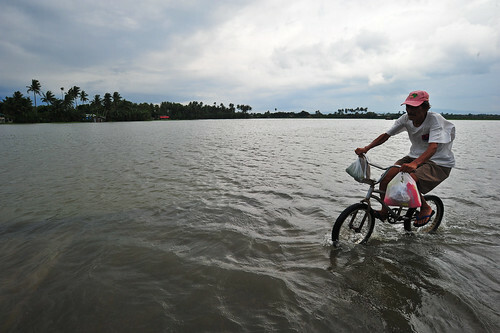 Flood waters in Laguna (Philippines) conceal vast submerged rice paddies. Submarino rice was bred by the International Rice Research Institute (IRRI) and can survive floods if they occur before flowering. The latest Submarino variety was released in the Philippines in 2009 and disseminated and promoted by the Philippine Department of Agriculture (DA) and the Philippine Rice Research Institute (PhilRice) to help rice farmers in times of floods and typhoons. Since its release, Submarino rice has been widely adopted by rice farmers across the Philippines, thanks to efforts by the DA and its agencies, which have been actively promoting Submarino rice to farmers. Their effective strategies have included involving farmers in early field trials and seed multiplication efforts across the country alongside information, education, extension, and communication campaigns and materials. “By planting Submarino rice, farmers have a fighting chance to outlast most rains and floods that unfortunately beset the country,” said IRRI Deputy Director General for Communications and Partnerships, Dr. V. Bruce J. Tolentino. The Submarino rice varieties currently available in the Philippines include Submarino 1 (NSIC Rc194, released 2009) and Sacobia (PSB Rc68, released 1997). Seed for these varieties can be obtained by contacting the PhilRice Text Center on 0920 911 1398, plus IRRI can provide small “starter seed” packs for multiplication by contacting info@irri.org. To help others in the community affected by the recent floods, IRRI is also coordinating donations from its staff to give to people in affected areas in the communities of Los Baños and Bay around IRRI headquarters.